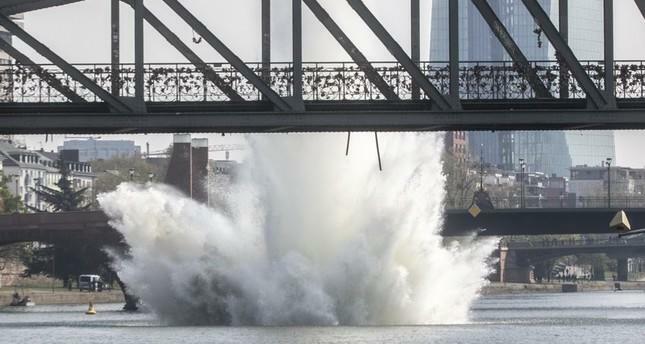 Hundreds of people were ordered evacuated from homes, hospitals, and public buildings in the old city of Frankfurt on Sunday so a bomb disposal unit could detonate an old World War II era bomb discovered last week in the Main River. The 250-kilogram U.S. Air Force bomb was reported successfully detonated, with dramatic photographs showing a massive wall of water spurting many stories high into the air. The "live" bomb had been discovered on Tuesday during a dive exercise in Frankfurt's centrally located Main River, close to city residential buildings. Both sides of the river were evacuated during Sunday's detonation, which authorities said went off without any issues, and divers were again deployed to examine it to ensure it was safe and had fully exploded. The BBC reported that "some 600 people were evacuated from parts of the city as bomb disposal experts got to work at about 08:00 local time (06:00 GMT) on Sunday." Now seven decades following the end of WWII, bombs and munitions turn up regularly throughout Germany, but such a large bomb located in the center of a major city is still considered rare. However, this weekend's evacuation pales in comparison to a similar detonation event almost exactly one year ago, in April 2018, when some 10,000 were ordered to leave central Berlin so that German police could defuse a WWII bomb there. For comparison, here is a 250km WWII-era bomb detonated in Munich in 2012, conducted above ground/water. Essentially this is what happened at the bottom of the Main River in Frankfurt on Sunday.